President Trump's pitiful showing at a Helsinki joint press conference with Vladimir Putin on Monday was perhaps the lowest moment of his presidency -- with the possible exception of his inexcusable initial reaction to the racial violence in Charlottesville, Virginia. Those two stand-out failures are connected by a common thread: The President of the United States indulging in grotesque moral equivalencies, each at least partially driven by his pathological compulsion not to excoriate people who shower him with effusive, if superficial, praise. After Charlottesville, he could have addressed the seriously problematic violence of far-Left agitators without repeating the nonsense that there were many "fine people" on "both sides" of demonstrations like this. 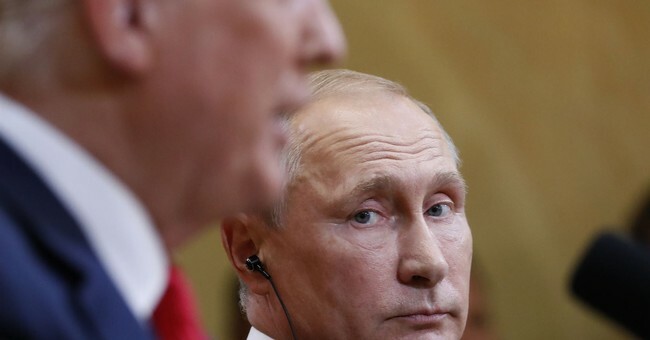 Likewise, he could have flattered and cajoled Russia's president in pursuit of improved relations and an enhanced partnership without effectively amplifying the Kremlin's disinformation campaign regarding their indisputable interference in the 2016 US elections, and without blaming America's "stupidity" and "foolishness" for our long and troubled history with Moscow. Having "great confidence" in your intelligence team means siding with their unanimous assessment over the forceful, cynical lies of a foreign adversary. And as we've seen elsewhere lately, attempting to forge a more functional relationship with an adversary must not entail an aspirational whitewash of that adversary's history of conduct -- especially if those actions remain active, and are not in "the past." Avoiding future treachery and malfeasance requires an honest accounting of, and consequences for, that (very recent) past. That said, I agree with Trump's defenders that some of the criticisms of his showing in Finland are over the top. Comparisons to Kristallnacht and invocations of words like "treason" and "traitor" are reckless and overblown. I'm also not of the mind that Trump was so embarrassingly deferential to Putin because the Russians must have some piece of ugly blackmail they're lording over him. Such accusations and conjecture are counterproductive and irresponsible. Occam's Razor suggests that the truth is simpler, and more juvenile: Trump is deeply insecure about any notion of an asterisk next to his election victory, leading to an endless parade of humiliating self-justifications. Beyond that, he admires "strength," likes people who praise him, and dislikes those who don't. It's that self-absorbed heuristic that often appears to drive his actions and explain his withering attacks on traditional allies and obsequious praise of certain enemies. He detests the idea that the 2016 election outcome may have come about thanks to any factor beyond his own prowess, so he wrongly conflates unambiguous acknowledgments of Russia's interference with an admission that he colluded, or at least received undue assistance along the way. (Remember, the Russians activated their machinery not only against Hillary Clinton and the Democrats, but also against Marco Rubio and Ted Cruz in the primaries). You can hold all 3 of these as true at same time: Russia hacked & undermined our faith in process/institutions; it’s a big deal & bad; it’s not why Trump won. This surreal stream of consciousness very much looks like it's rooted in assuaging his own ego, rather than serving the interests of the American people. That's unacceptable. It's cringe-worthy. Since his victory over Hillary Clinton, I've stated that my approach to covering and commenting on his administration can be described as "Sometimes Trump." The phenomenon of "Never Trump" was rendered moot the very moment Pennsylvania was called. The knee-jerk "Always Trump" chorus is an Obamaesque cult of personality, unmoored to any ideological or moral principles. Rather than choose between the latter two options, my aim is to call the president's actions and decisions as I see them, for better and worse. It's why I've lavished praise upon him when he's done well, including last week's Supreme Court selection. Applauding him, even when the Left hates it, has more than occasionally earned me scorn as an "apologist." But I'm not an apologist, so I ignore that carping. By the same token, when I believe he's wrong, I say so, even though that inevitably dredges up complaints that I'm a "hater." But I'm not a hater, so I disregard that whining, too. “Embrace what POTUS did OR CHOOSE WAR!” is rather reminiscent of the demagogic Ben Rhodesian false choice that conservatives deeply resented not too long ago. Really weak sauce in response to criticism of Trump today. Second, Mitt Romney's statement on this controversy was spot on. He correctly and directly called out President Trump, but also took a richly-deserved dig at President Obama (and his legions of media cheerleaders) who ridiculed Romney's clear-eyed understanding of the Russians and Putin during the 2012 election. The key word here is "remains:"
UPDATE - Today's "do over" statement was better than nothing, I suppose, but he should have made himself far clearer yesterday when he was standing next to Putin. And he still equivocated a bit on whether Russia was truly or solely to blame.